Unboxing and review of the Oracle Yoyo. 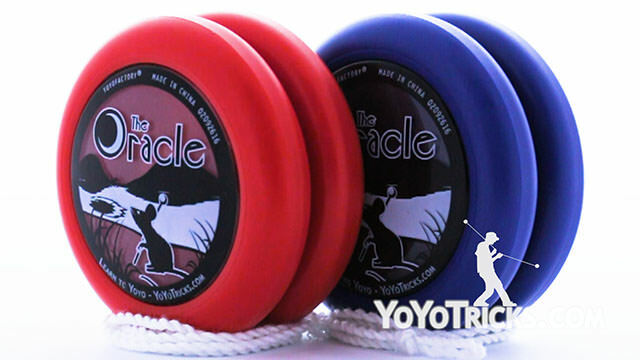 The Oracle Yoyo: Unboxing and Review Yoyo TrickThe Oracle yoyo is at the center of our strategy for teaching you how to yoyo, and we recently updated the Oracle to make it play even better than ever. 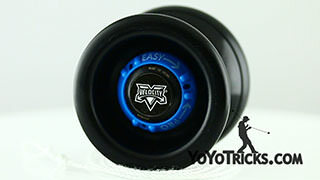 This is the Oracle yoyo. 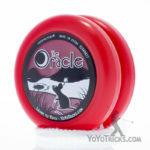 As you can see, the Oracle comes in our small box, which, is always easier to get yoyos out if you open the up from the bottom. There is the yoyo. If you look inside the box, you will also notice that it comes with some string. That string has been pre-shortened because with looping yoyos like the Oracle, shorter strings make it a lot easier to do tricks. So the string comes with an ideal length. So that it also nice. When we talk about the Oracle being at the center of our strategy for teaching you how to yoyo, what we are really talking about it that it is made to be the perfect complement to the Sage. 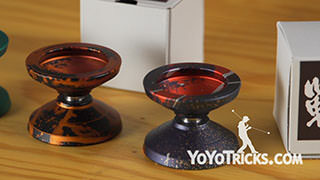 If you look at these two yoyos, you can see a lot of overlapping qualities. 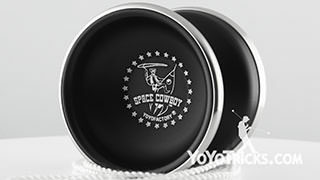 They are both made out of POM plastic which is really impact resistant so they are nice first yoyos to have because they can really take a beating if you happen to hit them on the ground a lot. 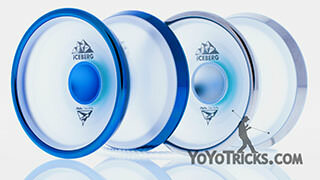 Or with looping yoyos, if they happen to collide together, it is a very durable model. You can also see the artwork on each of them has a similar aesthetic. We wanted to go with more of a fantasy theme for these because we felt like fantasy literature has a much broader appeal than almost anything else, and that is how we feel about yoyoing. It does not matter what age you are, it does not matter if you are a guy or a girl, it seems like everybody can really appreciate and enjoy fantasy and yoyoing. 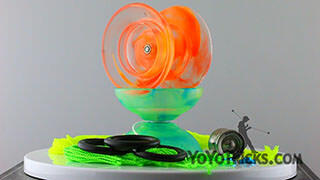 So we wanted to kind of stick with that with these particular yoyos to show that they go together. 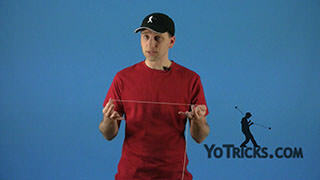 Now, when we talk about our learning strategy, what we are specifically talking about is our First 50 Yoyo Trick List. This is the trick list that we designed so that if you learn all the tricks in this list, then you are pretty much going to be able to go anywhere you want in yoyoing. If you want to get really good at 2A you can do that, if you want to try one of the other styles like offstring, you are going to be ready to do that. 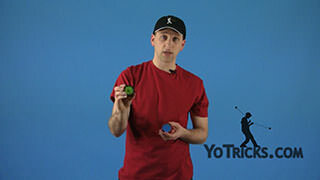 So within this trick list, we do some tricks that are more easily done with a 1A style yoyo like the Sage. 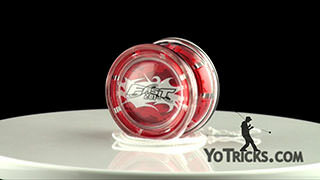 It is really wide and it is easier to get the string into the yoyo. Then some of the tricks are going to be more looping tricks, which is more suited to the Oracle, and also two handed tricks. 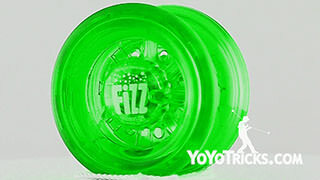 If you look at a beginner yoyo like the Fizz, you can see that this yoyo has qualities of both of these yoyos. 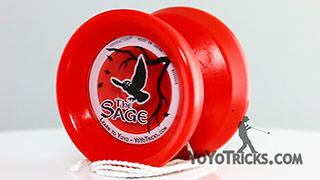 Just like the Sage, it has kind of a flared wing shape that is really wide and so no matter where you hit the string on each of these yoyos, the string will go right into the center of the yoyo. That makes learning string tricks easier. But unlike the Sage, you can see on the Sage, the inner wall is really low. On the Fizz, the inner wall is really high, just like it is on the Oracle. So this also gives it characteristics that make it pretty good for your first looping tricks. 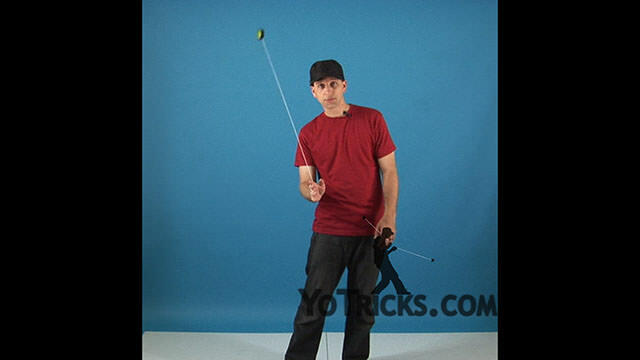 With the Fizz, being a beginner yoyo, the idea is that you can just get into the basics of string tricks, you can get into the basics of looping tricks, but once you are ready to get serious and rrally start working on more advanced tricks, you want yoyos that are specialized for each of those things. So that is why we wanted these two yoyos to go together so you can get that full experience of the ideal yoyo for each type of trick. 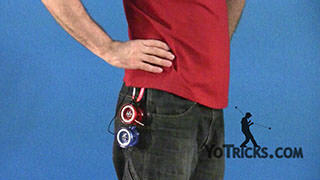 Now, when it comes to looping yoyos, pretty much what you want out of a looping yoyo is very simple. 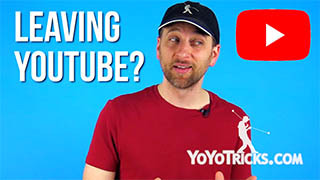 You want it to be able to loop very consistently, and you also want it to be able to sleep long enough to be able to do your Around the World tricks and your Wrap Tricks. So the Oracle yoyo definitely delivers in those areas. 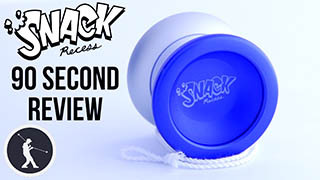 But I guess one of the questions is why do we recommend this yoyo specifically to players that are getting into their two handed style tricks? 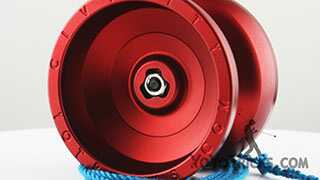 The Oracle has a number of features that make it ideal for new players when compared to other more advanced 2A yoyos. The first thing that we did with this updated design of the Oracle, if you compare it to an older Oracle, you can see that the old Oracle design had a flat side cap. On these new Oracles, we have rounded that out. 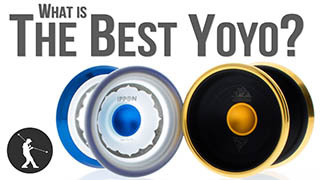 Now the reason why we made that change is because we found that just about all the advanced 2A yoyos that people are using in competition have this more rounded shape. We just wanted to experiment with it and see if we liked it. We were actually pretty surprised by how much more solid it made the Oracle feel. Just the way it changed play was just enough that it gave it a more satisfying experience. So we think that players are really going to like this improvement on the Oracle. 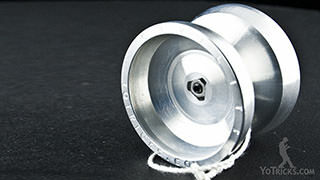 When compared to other 2A yoyos, it is really what is on the inside that makes the Oracle unique and particularly good for new players. The first thing that I wanted to point out was that there is no spacer in the Oracle. All that you have is this bearing on the inside. 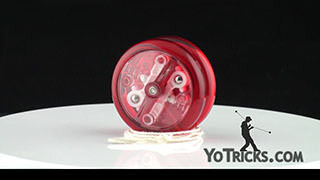 What is nice about that is if the yoyo ever falls apart, which can happen with new players, there is nothing to lose. All that you have to do is get the bearing back in place and you are ready to go. The other thing that is the most distinctive feature is that it has got this rubber response system in it. 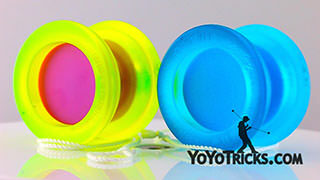 If you look at the majority of 2A yoyos, what you will see is that instead of this rubber response system, they have got these starbursts, these little ridges on the inside that help the yoyo respond when you want to pull it back up. There are advantages for more advanced player that these starbursts have, and I will explain those, but for new players we really prefer the rubber response system. The reason why more advanced players seem to prefer the starburst system is because if you think about it, the longer you play with the yoyo, these rigid starbursts are not going to change a whole lot over time. 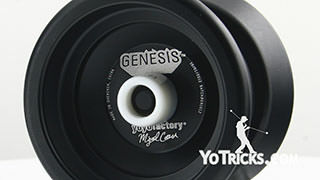 So even if you have put in 50, 60, maybe even 100, hours of time into this yoyo, it is going to play really close to how it played the first time that you got it. With a rubber response system like these, it is going to slowly wear down over time until you change it. Then it is going to slowly wear down again. So over 10, 20, 30 hours, you are going to notice a slight difference in play. What we do like about the rubber response system is that for every string that you put on a yoyo, that string is going to play consistent longer on a rubber response yoyo than it will on a starburst yoyo. So what do I mean by that? When you take a string and you put it on one of these yoyos with the starburst, let us say when you put it on it plays exactly the way that you want. Then after five minutes of play, the string is going to start to thin out a little bit. So because these are not quite as aggressive as this rubbery response system, when the string gets thinner, you can really feel the difference in play. Then 10 minutes later, it plays even a little bit different than that. Then 20 minutes later, it plays even more different. 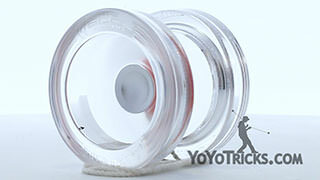 With the rubber response, you will find that even after an hour of play, the yoyo plays more similar to how it did when the string was new than it will after even 10 minutes of play on one of these. If you think about a competitor, they only need the string to play consistently over a three minute routine. So they do not really care so much if the string has changed a lot over the course of 10 minutes, because they only need it for their routine. 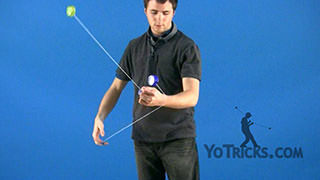 But when you are practicing, it is really nice to have a set up where the yoyo continues to play consistently through the whole life of the string. If you think about practicing 2A, in order to learn every single trick, you have to do it a thousand, maybe even 10,000 times. So you are just constantly drilling the same tricks over and over and over again. And you know, most of those tricks only take a half of a second, so you can go through them quickly. But every time you change a string in a 2A yoyo, you also have to lube the yoyo and sometimes you are going to have to clean the bearing as well. So the fewer times you have to change the string, the less maintenance you have to do all the time. 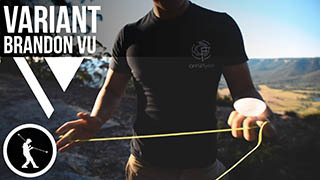 So if what you are interested in is practicing, if what you are doing is interested in drilling your tricks, it is a lot nicer to have a pad response yoyo so that you can get a lot more life out of each string. 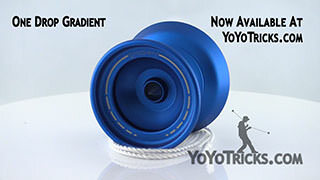 In my experience, I can probably get strings to play six to ten times longer on a yoyo like the Oracle than I would be able to practice on a starburst design yoyo. That may seem like a small thing, but when you are in the midst of practice, it is actually a pretty big deal. Eventually you will need to change these response pads out. What I have found is practicing one to two hours a day, I need to change them about once a month. So that it a lot of practice time, it is not all that often. When you do change them out, we have got a video that teaches you how to put in new pads. It is pretty straightforward, so you will not have any trouble with that. 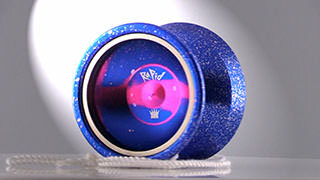 Again, it kind of makes the yoyo feel like it is brand new again, which is nice. 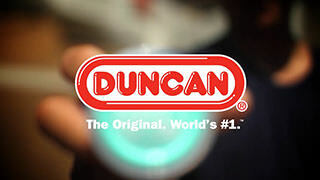 We do recommend that you lube the bearing with Thick Yoyo Lube. Just put a little bit of lube in the bearing and if you want more response, you can even put a tiny bit right here, out where the bearing touches the yoyo. After a couple of loop cycles, it is not a bad idea to put a drop of Thin Lube in the bearing as well, that kind of frees it up and helps it to spin longer. If you want your pads to last as long as possible, make sure that you do not get any lube onto the pads because that can make them come out prematurely. Also, as we mentioned before, when you are learning looping style tricks, you are going to want to use a shorter string. 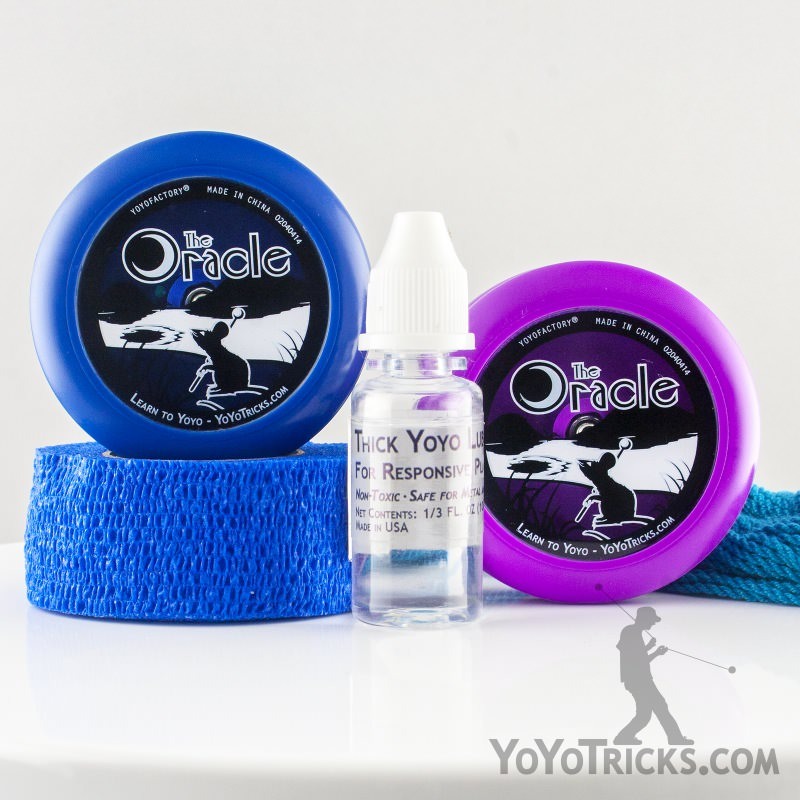 Now, we actually demonstrate how to lube the yoyo, how to maintain it, and we give recommendations for string type and string length for both the Oracle and for yoyos with starbursts in our 2A-5A Yoyo Buyers’ Guide. So if you want more information about that, we definitely recommend that you check out that video. But like we said, if you are just getting into yoyoing and you want to explore the full breadth of yoyo tricks, we highly recommend both the Sage and the Oracle for their respective tricks. We think that you are going to have a great experience with those. It will just help your learning on every front go a lot better. 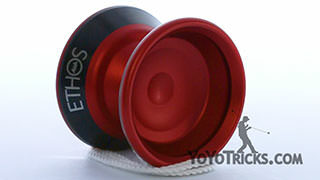 So that is the Oracle yoyo.